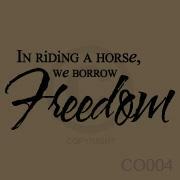 Use this beautiful wall decal to show your love for riding horses. Use on a car, wall, glass block, wood board, laptop, or anywhere that a sticker would be placed. Borrow Freedom was added to your cart successfully!